The show explores works by artists creating paintings and drawings on a time honored raw product - paper. An unforgiving surface around for centuries paper reveals the artist's proficiency in creating works of visual art. The exhibit features a selection of paintings and drawings depicting an array of subjects from traditional landscapes and cityscapes, to abstract works by artists' Patricia Chandler - acrylic, graphite and mixed media; Randy Eckard - watercolor; Julianne Garvey - watercolor; and Bob Santandrea - pastels. Woks on Paper is on view free of charge every Friday, Saturday, and Sunday between the hours of 10:00 a.m. and 3:00 p.m. through March 30, 2018. Additional days and times by chance or scheduled by appointment. For more information about the exhibit contact Richard Boyd Art Gallery by phone at (207)-712-1097, via email at info@richardboydartgallery.com or visit the gallery website at http://www.richardboydartgallery.com . Like the gallery on Facebook at http://www.facebook.com/RichardBoydArtGallery . 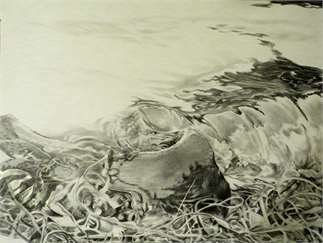 Image: Patricia Chandler ~ "Edge of the Tide" ~ Graphite on Paper 18.5" x 23"